Lee added that the ministry's decision was based on a set of principles: maintaining fairness vis-a-vis active-duty service members, preventing any exploitation of alternative service to avoid military conscription and respecting international norms in a way that does not compromise security readiness. The defense minister is to officially appoint its 29 panel members -- 10 named by the National Human Rights Commission, 10 by the justice minister and nine by the defense minister. Its chairperson will be selected through a vote by the members. The defense ministry hopes to submit the two bills to the National Assembly early next year after further consultations among related ministries and a review by the legislation ministry. In recent months, the ministry struggled to reflect both demands from objectors and rights activists, and concerns about fairness and a possible spike in applications for alternative service. During the period, it held a series of public hearings, carried out public surveys and gave parliamentary and press briefings. However, the NHRC expressed concerns, noting the proposed measures may lack reasonable grounds for setting details about alternative forms of military service. 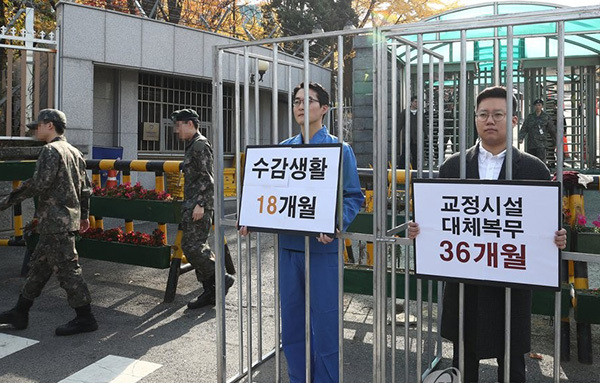 "We voice deep concerns that the defense ministry's measures do not fully reflect the intent of the Constitutional Court's decision and international human rights standards," Choi Young-ae, the watchdog's chairperson, said in a statement.